The Coverage Opinions home page needed a face lift. 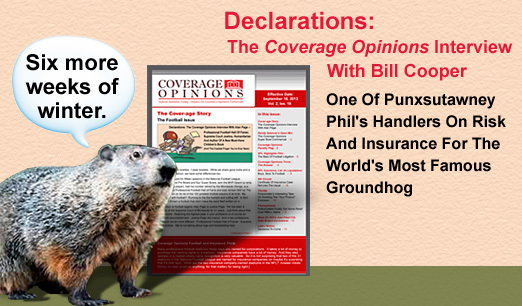 It was originally created when Coverage Opinions was launched in October 2012. Much has changed about the newsletter since that time. The home page needed a refresh -- in Coverage Opinions style -- to reflect those changes. As expected, the Coverage Opinions Caption Contest brought out some fun responses. I suspect that many in the insurance industry share this guy’s sentiment when they look at their desks. Boys it’s Valentine’s Day later this week. Fear not. You can never go wrong by singing an insurance coverage love song to your significant other. Like so many dog lovers, I will be glued to the television this week watching the 138th annual Westminster Kennel Club Dog Show. Dogs sometimes bite people. But what about show dogs? That question is answered here. Just because show dogs probably get made fun of at the dog park, and have their lunch money stolen, some have a toughness behind their cucumber facemask. February 2nd was Groundhog Day. The care of a groundhog, especially Punxsutawney Phil, the world’s most famous groundhog, is not without risks. The paparazzi can be brutal. Bill Cooper, one of Phil’s handlers (one of those guys that you see, surrounding Phil, wearing a top hat and tuxedo) discusses what it takes to address the risks..
An insurer was served with a DJ complaint at the address stated in the policy for doing so. It misplaced the complaint and a default judgment was entered. A court (supreme court in fact) addressed this situation for the first time ever and upheld the default judgment. Many courts lately have been harshly penalizing insurers for breaching the duty to defend. K2 and others as well. The Eleventh Circuit went the other way. It did not saddle the insurer with any consequences – other than the most basic -- for breaching the duty to defend. Pennsylvania now has much needed Supreme Court authority on the question whether emotional injury qualifies as a sufficient injury for purposes of triggering “bodily injury” coverage. But the case flew well under the radar compared to the attention that other Supreme Court coverage cases attract. Supreme Court To Insurers: SIR You Listening? Insurers that issue policies with a self-insured retention understandably have a lot invested in the language of their SIR provisions – especially to the extent that they address how to determine whether the retention has been satisfied. The Florida Supreme Court provided insurers with food for thought for considering whether their self-insured retention provisions – even if they think they are clear – are clear enough.